Designer Ben K. Mickus of the Mickus Projects based in New York will unveil his “Relief Chair” at the Cooper-Hewitt National Museum of Design, in New York, this Friday, March 6th, as part of the “Fashioning Felt” exhibition. The solid/surface/series collection re-masters the art of sculpting using digital fabrication and solid, rapidly renewable materials. Upholstery, foam products and finishes are all supplanted with thick sheets of natural wool felt, adhered with non-toxic water-based adhesives. The precision-cut contours of each piece of felt are aggregated into sinuous yet comfortable forms with cascading edges. 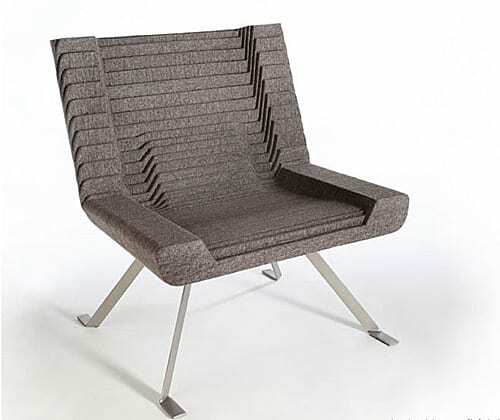 The classic lines of modern Relief Chair will certainly be right at home in any stylish environment.